Chen Rong, Nine Dragons (detail), dated 1244 (Chinese, Southern Song Dynasty). Ink and color on paper. 18 7/16 x 589 3/16 inches. Courtesy Francis Gardner Curtis Fund. The friendship of painter Bill Jensen and poet/translator extraordinaire David Hinton grew out of a shared interest in Eastern philosophy, Chinese poetry and painting, and other related subjects—and it is a friendship that seems to deepen as the years pass. At the Rubin Museum on October 14, 2015, they held their first public conversation, meant to replicate the many private conversations they’ve had over the years. This event marked the publication of Hinton’s radical new translation of the I Ching (Farrar, Straus and Giroux, 2015). The following is an edited version of their discussion. Portrait of Bill Jensen. Pencil on paper by Phong Bui. From a photo by Zack Garlitos. Portrait of David Hinton. Pencil on paper by Phong Bui. From a photo by Phil Dera. Bill Jensen: In addition to your many beautiful translations of Chinese poetry and philosophy, you published a wonderful book of poetry in 2004 called Fossil Sky—actually a kind of poem-map, as it is laid out on a single huge sheet, the lines arcing and twisting through space, a poem with no beginning and no end. You have also written two books of essays. The first, Hunger Mountain, published in 2012, is laid out a little like the I Ching. It recounts multiple walks up a mountain near where you live in Vermont as a way of presenting ancient Chinese wisdom in a contemporary context. Your second, Existence: A Story, which will be published this coming summer, discusses a single 17th-century Chinese painting by Shih-t’ao as another way of exploring those ancient insights (though you do so in a very literary, rather than academic, way). Your other forthcoming book, Talk of Mysteries, about 20th-century avant-garde poetry, explores how those poets wove consciousness back into landscape or cosmos, and how so many of their poetic insights were acquired from ancient China. It is part environmental philosophy, part ecopoetry anthology. I want to start by saying that I’m from rural Minnesota and I think I was probably a junior at the University of Minnesota when I took Professor Robert J. Poor’s class on ancient Chinese painting. He put up the first slide and I was thunderstruck. Since then I have been obsessed with Chinese painting and philosophy. I’m severely dyslexic, which you will probably hear more about tonight, so reading was really difficult for me. But the paintings—when I studied the paintings, on the side there were Chinese poems. One I looked at had translated poems on the bottom, and I read them, and I thought, I can read this. They’re very concise. They’re very exact. Their imagery has great impact, but there’s a lot of space around the words, which you might talk about today. I discovered your writing at a great bookstore in Marfa, the center of Minimalist art in west Texas, where I came across this book, Classical Chinese Poetry: An Anthology. I picked it up, read the first page, and was stunned at the clarity of your writing. I had never heard things discussed that clearly: a 20th-century mind understanding a three-thousand-year-old mind. Since then, I’ve been obsessed with your books, and you. Margrit and I are very lucky that you spend one night a week at our house in Williamsburg when you teach at Columbia. We have these intimate talks in my studio, and I’m hoping that we can recreate the same thing here. I think you can, I don’t know if I can. [Laughter.] But I think I’d like to have you talk about your early connection to aesthetic experience and Chinese literature. David Hinton: For me, I think it really started in college, when I remember seeing raindrops hitting black pools of water: that ignition of light, followed by circles expanding and disappearing before another raindrop hit the pool. That idea of things appearing out of nothing, and disappearing into nothing. I knew I could see something deep in that, but I didn’t know what it was. Though I did feel that appearance and disappearance was somehow happening not just in the darkness of the pool, but also in the darkness of consciousness, the silence of an empty mind. At the time I was reading the Tao Te Ching and Ch’an (Zen) Buddhist texts. Another defining experience was growing up in Utah where there are huge mountains and skies. That open space defines me, really, defines my mind. I don’t know if I’ll get to show how that relates to ancient Chinese insight and art, but it’s there. I also remember that I was sitting in a lounge in the university library when a friend came up to me with a Gary Snyder book and said, “My God, listen to this!” He read a poem, and that was it. Snyder led me to this conjunction of Asian culture, environmental thought, and poetry. That’s what really drives my interest in ancient Chinese culture: the deep ecological thinking that suffuses the arts of ancient China, where it’s always lyrical and beautiful—and very contemporary for us, still radical. So translation is a kind of philosophical project for me, having to do with ecological thinking, thinking outside the Western tradition in a radical way. The modern American poets in the book you described had to do a lot of work to escape the assumptions shaping Western thought, and the restrictions imposed by a Western language like English. Translation lets me simply step outside the tradition and work there, think there. It also lets me operate outside the limitations of my own identity. Jensen: Isn’t there a small book that started you translating: A Little Primer of Tu Fu by David Hawkes? You read this book and thought, maybe I can do this. Hinton: Yes, I was living in New York, failing to get a job in publishing. I’m pretty inept at that sort of thing. I read in a couple of places that Tu Fu was the greatest poet in Chinese history. It happened a few times in a single week, so I thought I’d better find out. I went to the great public library on Fifth Avenue, which had one of the great Oriental collections at the time, and read everything that I could find. I wasn’t really convinced until I found Hawkes’s book, which had about thirty of Tu Fu’s poems from original to word for word translations, line for line translations, and prose translations of each poem. I saw how much the English translations were leaving out and spontaneously started translating them, trying to get them right. For a month or two I was there waiting every morning when the library doors opened, and I was the last person to leave at night. It was so exciting. I could translate almost like I could read Chinese, because I could see every step all the way back to the original. So I went back to graduate school at Cornell to study Chinese, before moving to China for a couple of years, which is where I began translating the Tu Fu book, my first book. Bill Jensen, Loom of Origins, 2014  15. Oil on linen (triptych). 62 x 123 1/3 inches. Courtesy the artist. Jensen: You were at my house when I was trying to read an older translation of the I Ching. It was about 800 pages, which is like Mount Everest for a dyslexic. [Laughter.] When you came in, I told you how frustrated I was, how it just seemed over-laden. You said that you had been thinking about translating the I Ching for a long time: a version pared back to the original mysterious text without all the secondary commentaries. What was your motivation? Did I push you over the edge? Hinton: That might have been the nudge that did it, yes. I wanted to get back to the earliest levels, still mysterious and poetic and without explanation. You know, the hexagrams themselves are the actual text, the actual I Ching book. I love that because the hexagrams are not language. They are a kind of proto-language. Primal emptiness separated into heaven and earth. That’s how it all began. Before long, a pair of dragons emerged from Bright-Prosperity Mountain: Root-Breath and Lady She-Voice. Now, dragons in ancient China embody the awesome force of change. A dragon was in constant transformation, writhing through all creation and all destruction, shaping itself into the ten thousand things tumbling through their traceless transformations. So perhaps the appearance of these dragons was the beginning of the ever-changing diversity of things we know as the Cosmos. The legend doesn’t say. Root-breath and Lady She-Voice were dragons, but dragons with human heads. They became the first couple, husband and wife, and Lady She-Voice gave birth to humankind. So you see, we are descended from dragons: we have dragon hearts pumping dragon blood, dragon minds thinking dragon thoughts. That’s one of the legends in China that I like a lot: the idea that the hexagrams emerged almost from the beginning of the cosmos, that this book emerged almost from the beginning of the Cosmos. 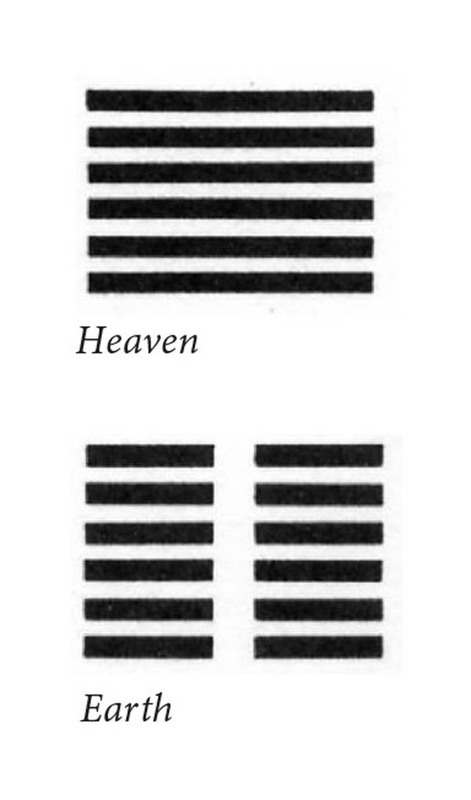 In the I Ching there are sixty-four hexagrams. Each hexagram has six lines made up of yang lines, solid lines, and yin lines, broken lines. Yang and yin are the two fundamental principles of the universe: male and female, light and dark, active and receptive. And it’s the interacting of those two principles that creates all change. So the sixty-four hexagrams represent every possible variation of yang and yin in six lines, which is every possible stage in the process of change. In reading the I Ching or consulting it, you experience the hexagrams always changing, always moving from one hexagram to the next. In this, they participate in the same process of change as the cosmos, or the earth. Everything else, the linguistic part of the text, the part I translate, is technically commentary on the hexagrams, the non-linguistic part. There are so many layers of commentary, but I tried to go back to the first four, the really old ones: Confucius and earlier, so 6th century to 1200 B.C.E. The huge editions that you get in English, eight or nine hundred pages, include later layers of commentary. The earlier levels establish the mystery of the I Ching, while the later layers are more explanatory, repetitive, much less interesting. In addition, the major English editions include large commentaries by the scholars who translated them. In the Wilhelm edition, the well-known version that John Cage used so much, Wilhelm’s commentary is probably larger than all the Chinese commentaries. Jensen: So I had three questions to ask you, but I think you have answered all of them. Jensen: You say that it’s both primal and postmodern, and that there’s a worldview that’s embedded in the I Ching. Could you describe it? Hinton: Well, the I Ching is really a kind of proto-philosophical text for Taoism. The ideas are more fully evolved, expressed more clearly, in the Tao Te Ching, though it is pretty mysterious too. The I Ching is Taoism in its nascent form—the idea of the cosmos as a single generative tissue that’s constantly changing itself into one configuration after another of what the Chinese call the “ten-thousand things.” Those things disappear, and then there’s a new configuration. It’s as if all of these “ten-thousand things”—trees, mountains, peoples, cities, gardens, and everything else—emerge out of emptiness, and go back into it. Like the circles of light I saw when raindrops hit a pool. It’s like the seasons: winter is a kind of pregnant emptiness, spring is burgeoning forth from that emptiness; summer is the flourishing; and autumn the dying back into winter, empty and dead but pregnant with possibility of spring. It’s a different way of seeing the cosmos than we’re used to, but it’s also remarkably contemporary. I like to think of it as deeply feminist because it sees the cosmos as female, as generative in its most essential nature. It’s deeply environmental because it sees humans as part of natural process, not outside of it. It’s spiritual but secular, and it also is basically in accord with modern science. The first chapter begins like this in my translation: “All origins penetrating everywhere.” So that the cosmos is all origin really—it’s this generative tissue that’s continually reshaping itself: “All origins penetrating everywhere, heaven is inexhaustible in bringing forth wild bounty.” Well, it’s popularly known as a divination text. But not divination in the sense that it will tell you what’s going to happen to you—like you’ll meet a tall, dark stranger; you’ll inherit a million dollars; or whatever. Instead, it shows where you are in the process of change, and encourages you to think philosophically about where you are in that process, and about how to proceed in harmony with change. There’s an image for that fundamental reality of change: the dragon, which is the embodiment of the dynamic energy that drives the cosmos, that generative nature of reality as a tissue of transformation. There are a number of great dragon paintings from ancient China, like the Nine Dragons (1244) at the Boston MFA. It’s interesting that the painter, Ch’en Jung, not only painted the image of change, but enacted its energy directly. You can see it in the splatters of paint on the left side, where Ch’en splattered paint across the paper. Jackson Pollock dripped and flung paint for the same reason—not painting nature—but enacting its energy. And this is what I feel so dramatically in your paintings, where you see not only that enactment of primal energy, but also abstract images for it. Amazing! Call them your dragon paintings! Later on, the Tao Te Ching develops the idea that the cosmos is a single generative tissue a lot further. It took me a long time to figure out that we tend to think of emptiness as an almost metaphysical realm: this pool of emptiness some place in the universe that things are coming out of. But that’s not what it is. It’s the material world seen as a single, undifferentiated tissue that keeps reshaping itself. So that undifferentiated tissue takes the shape of a tree, eventually the tree dies back into the undifferentiated tissue, and then the tissue shapes itself into something else. I think that allows us to talk about emptiness without talking about some mysterious, metaphysical, mystical dimension. The I Ching operates in that system, and keeping those ideas in mind makes sense of the seemingly mysterious utterances of the I Ching and the Tao Te Ching. I tend to think of them as pretty straightforward and clear, not dark and inscrutable mysticism, and I try to translate that way too. I just said, “Okay, I’m going to treat it like any other book of poetry,” and I think that’s what let me see it in a clearer, more empirical way. It’s also why I wanted to strip away later commentary and just get at the original text, let it be as clear as possible, and also as mysterious. Bill Jensen, Book of Songs I, 2010-11. Oil on linen, diptych, 54 × 44 inches (large panel) and 53 x 40 inches (small panel). Courtesy Cheim & Read, New York. Jensen: And you say it appeared around the same time as oracle-bones? Hinton: Yes. Oracle-bones were used around the same time as the traditional date for the I Ching, about 1200 B.C.E. Oracle-bones are the oldest surviving example of written language in China, though we know written language developed far earlier. Diviners would etch a question into a turtle chest-bone, and then press a hot metal poker against the bone, which would crack the bone, giving an answer. In a traditional context, the bones would answer specific questions—“Should we do this? Should we do that?”—usually for the emperor. The system assumes something that was familiar in the West: that there was some kind of outside power defining the future, and divination was somehow appealing to that power to reveal its intentions. The Shang Dynasty imagined a form of monotheistic God that ran the universe, a lot like a Western monotheistic God. The world that I Ching represents replaced that: rather than a universe controlled by an outside force, it recognized the universe as an unfolding of things from inside. And so, it works very differently as a divination tool: simply telling us where we are in the process of change and ways of thinking about moving forward, instead of telling the future as if some God were controlling it, and so could say through diviners what will happen. Jensen: You think I’m a perfect reader because I have an understanding of Taoist philosophy but no understanding of the I Ching. Your book is like mysterious poetry to me. The way you explain it, the I Ching is this constant unfolding of things. When you throw coins to locate a hexagram, what you find is your point within that change, so you have a perspective from which to move forward and backward. Hinton: Yes. Unlike most divination systems, the I Ching offers philosophical attitudes toward existence. It encourages you to be a philosopher and to think about yourself and your place in the cosmos. Then it encourages you to figure out how to move ahead. But I think you’re the perfect reader because you paint out of that same conceptual framework, I want to introduce your work to everyone. And since you speak primarily in your paintings, I thought we could show a few. I see in your paintings that same generative energy: that energy driving the cosmos. Could you talk about how that works for you? Jensen: Well, when I was at Skowhegan my paintings changed radically. I thought I was painting the landscape, what nature is in and of itself, outside of our human perspective. Then about five years later, I read that this is one of the big things about Taoist philosophy, which had been around for thousands of years but was finally written down in the 6th century B.C.E. That’s the Tao Te Ching, which says that human beings do not see nature or the cosmos directly, that we mannerize it in these little book ends because we need that, we need to do that to feel safe. So from the 6th century on, the Chinese tried to show the cosmos itself, without our human stories about it. Huai-su, Autobiography of Huai-su (detail), dated 777 (Chinese, Tang dynasty). Handscroll, ink on paper. 28.3 x 755 centimeters. Collection National Palace Museum. I thought it was an unbelievable concept, and I’ve stuck with it. It’s how I’ve developed a process where, at a certain point, something is born in the painting. It comes from the process: at a certain moment you feel this thing that’s in the paint. It is a living tissue and it’s my job to nurture it and to let it clarify itself. And if I’m not sensitive to it, I’ll lose it. But it’s important that I don’t judge it, that I accept it on its own terms, which is that famous phrase from Taoist philosophy “occurrence appearing of itself”: not some interpretation of the thing, but the thing of itself. I have to accept it or else I will completely lose it. Early on, I realized that I could not paint very strong aesthetic events just by looking out at something. I thought that if I could somehow make my art a living tissue, that everyday I could go to the studio and be dragged a little further; so that now, twenty years later, I look back and see that I could have never dreamt where that living force would take me. You need a high tolerance for embarrassment and anxiety, but I really wanted it to be a living force that can drag me to places that I never could dream of going. That’s what connected me to the Taoists. Hinton: You’ve also mentioned that in the studio you have to get down to the empty tissue before the painting can emerge. Jensen: Somehow you’re always able to write about what artists go through. I’m going to paraphrase this. If I get it wrong you can correct me. Basically, the cosmos operates on a level at which things are created and destroyed in a flow. If an artist can get down to that level, they can work the same way nature does, without questioning or thinking. At that “existence” level. I think it’s when these things rise out of emptiness that you can grab them most immediately and beautifully. I have realized that if I just sit there and let everything fall away, I experience what I used to call boredom but what Chinese philosophy refers to as cultivating idleness. [Laughter.] I finally realized a couple of years ago that if I can still my mind, these things will rise up. I noticed many years ago that the first thing that got me out of my chair to make a mark was always really important and I try to keep that feeling throughout the painting. I compare it to that generative tissue. Your new book describes my life somehow, what I feel is going on in my studio. Hinton: You can really see it in your paintings. Another common metaphor for it is “a loom of origins.” Chuang Tzu said: “The ten thousand things all emerge from a loom of origins, and they all vanish back into it.” And you have a painting to prove it. Jensen: The loom makes a thread of everything. And everything is tied together. There is an interdependence of everything. Hinton: But what you described is your creative process. Quite profound in terms of this cosmology we’re discussing. Could you also talk about the finished product, the painting, how it represents or enacts that generative energy. Perhaps how it draws us into, makes us participate in or belong to, that energy driving the Cosmos. Which is, by the way, the goal of sage wisdom in ancient China. Jensen: The aesthetic connection that is made between the art object and the viewer is very difficult to explain. It is like trying to explain the connection to the Tao. There can be knowledge to help us connect, but the connection must be made on an involuntary and instinctual level. The Hindu Vedic literature, which was written 6000 years ago, talks about this connection, and calls it “Rasa,” the highest form of human consciousness. At this level the artist is made aware of the areas of their psyche that they are not normally aware of. These areas contain feelings, experiences and images never realized before. If an artist can articulate an image into a physical object, then this object can be felt by others who are sensitive to the aesthetic experience. The viewers are then connected to the areas of their psyche that they are not normally aware of. The object has connected the viewer to their own personal relationship to the cosmos. They are then deeply connected to everything around them. This connection is life-changing and very necessary for the well being of the tribe. In ancient societies the sages or shamans would do this. Without this connection the ego, the inner self, becomes all encompassing in its narcissism and a danger to the balance of the cosmos. Hinton: I think that your painting Occurrence Appearing of Itself—named after that concept you mentioned a minute ago—has a lot to do with that idea of an ontological tissue that is a generative source, whether it generates art or seasons or mountain ranges. Mi Youren, Cloudy Mountains, dated 1200 (Chinese, Southern Song dynasty). Handscroll ink on paper. 10 7/8 x 22 7/16 inches. Ex coll. : C. C. Wang Family, Purchase, Gift of J. Pierpont Morgan, by exchange, 1973. Courtesy The Metropolitan Museum of Art, New York. Hinton: Traditional Chinese landscape painting illustrates some of the same concepts in different ways. They contain a lot of emptiness: mists, lakes, skies, rivers, are all depicted as empty space—raw paper or silk, or pale washes—and the landscape elements seem to be emerging out of that emptiness. Chinese calligraphers aspire to compose with the spontaneity and energy of the Cosmos itself. Ideograms transformed by that energy animate the emptiness around them. When we read, we concentrate on the text. We don’t pay attention to the white space around it. But for the ancients, that white space is the emptiness from which the text emerges. That’s what a calligrapher’s doing, bringing that text out of emptiness and shaping it with the energy of the cosmos. It’s very much like gestural Abstract-Expressionist painting. Jensen: I think we should ask the I Ching a question. Hinton: I have a question! I’ve been translating all this Chinese, thinking through these ideas, cultivating insight, but I’m getting old and tired: no more interest, no more questions to ask. And the essence of that insight is to forget ideas and insight, which means an end to asking and answering questions. So what do I do now? [Laughter.] That’s my question: If I’m not interested in questions anymore, what do I do? I’m going to use coins. Much faster than yarrow stalks, the traditional method. I’ll read you the answer after I throw them. [Tosses coins.] Alright: three, six, eight, so that’s a yin line. I should mention that there is a guide on how to do this at the back of the book. Heads is three, tails is two, and you add them up so that the different possibilities create the yang and yin lines. [Tosses again.] Okay, two, four, seven, which is a yang line. [Throws coins again.] Nine is an old yang. I’ll tell you what “old” means in a minute. [Throws coins again.] And six is an old yin. Ah, this makes it complicated. We need one more. [Throws coins once more.] Two, four, seven: a yang. I should say that I was never much interested in the fortune-telling dimension, and that determined how I translated the book. I was interested in the way the ancient poets, artists, and intellectuals read the I Ching primarily as a book of philosophy, not as a fortune-telling system. Throwing is a different way of reading it for me. It’s kind of a magical text because it’s endless. You can read it start to finish like a normal text, but usually you would consult it with yarrow stalks or coins, so the text you read is randomly determined. And your situation helps define the meaning of the text, how you read its vague statements, so each time you consult it the meaning changes. No beginning and no end. Okay, now we have our various lines, we can group them into two trigrams—the top three lines and the bottom three lines—which we look up in a table. So we have a yang and two yins for the top one, and two yangs and a yin for the bottom, and looking in the table we find that it corresponds to hexagram eighteen. There are actually not just two types of lines but four: young yin, which is stable; old yin, which is on the verge of changing into yang; young yang, again stable; and old yang, which is about to change into yin. So our hexagram, with its two old lines, is changing into a new hexagram: number six. This is how the hexagrams are always changing, like reality, always moving toward a new situation. So remember my question? Hexagram eighteen is called “Maggot-Bowl” the way I translate it. Sounds like trouble. [Laughter.] “All origins penetrating everywhere, decay’s maggot-bowl brings forth the wild bounty of crossing a great river. Before every turning point, there are three transition days. After every turning point, there are three transition days.” Does anybody know what that means? I don’t. [Laughter.] It’s poetry. I think it’s saying that if I don’t have any questions anymore, it’s in a sense both an end and a beginning. The end of questioning is the beginning of something new, an engagement with experience that is direct and unquestioning, reality as-it-is in and of itself. Much deeper than reality as a subject for human conceptual frameworks. Exactly what you were talking about when you described the relationship between your painting and Taoist thought. Bill Jensen, Occurrence Appearing of Itself, 2006  09. Oil on linen. 54 × 40 inches. Courtesy the artist. The hexagram is divided into two trigrams. There are a total of eight trigrams and every one has a name and a nature. Our two are “mountain,” the nature of which is “still, abiding;” and “wind” which is “reverent, inward.” Each hexagram is a unique combination of two trigrams, and the third level of commentary is based on those two trigrams: “Beneath mountains, wind blowing: that is the maggot-bowl.” So there is a sense of stability above but turmoil underneath, some kind of driving force underneath. That makes sense for my question; the stillness of having no more questions infused with a force that transforms experience into something new; maybe a life of more immediacy, rather than the distancing created by questioning and judgements, etc. The commentary continues: “the noble-minded stir the people into action and foster heart-sight clarity.” That seems like advice for a ruler. In ancient China, the people who would have used the I Ching were intellectuals, meaning government bureaucrats and advisors. Only they were literate. Only they could read. And there was a belief that seeing deeply into things, feeling them immediately (the Chinese didn’t separate heart and mind: they were a single entity)—that seeing and feeling deeply was the essence of wisdom. Next, the commentary turns to each line of the hexagram separately, starting from the bottom: “Decay’s maggot-bowl governs a father, and from that comes a child. And so, even when the father dies, nothing goes astray. From affliction comes good fortune whole and through to completion.” There is this sense throughout the I Ching that the generative process produces good and wonder, no matter what happens; that sheer existence itself is wondrous and majestic, however tragic the situation at hand might be. Hence, “nothing goes astray.” However tragic the situation at hand might be, it will soon transform into something new, something wonderful: “From affliction comes good fortune whole and through to completion.” Maybe the affliction is the feeling that I’m in this place without questions or answers, being restless, wondering what to do. So out of that affliction “comes good fortune whole and through to completion,” implying that something good will come out of it. So you see, it doesn’t give you answers, it gives you a philosophical framework. On a related note, how do you mediate chaos in your work? Bill Jensen, Double Stillness, 2014  15. Oil on linen (diptych). 50 x 86 inches. Courtesy the artist. Jensen: A common idea is that an artist brings order to chaos. But I want art that brings chaos to our limited mannerist view of the cosmos, the cosmos within our conceptual framework. Art, especially in the 20th and 21st centuries, is like a Zen koan that jolts us towards enlightenment. As far as karma or divining goes, the future is a tricky place for anyone, especially an artist. I want to be as open as possible, a big receiver of anything that falls from the cosmos. For me to limit the future seems counterproductive. I would rather receive all of it than be leery of this or worried about that. If something bad happens to me, I might make a good painting out of that experience. Hinton: In the I Ching there is no chaos in a sense because it sees the cosmos as a harmonious whole. What we call chaos is that which doesn’t comport with our desires or our understanding. Within the cosmos as a whole, there is no chaos. It only appears to exist within our conceptual human framework. In the same way that you talk about letting your paintings unfold without judgment, I think calling something chaos amounts to a judgment. You’re saying, “This is chaotic because it’s unfamiliar or unsupportive of human endeavor, while this isn’t chaotic because it’s a café where I can get an espresso.” But, in fact, there’s no difference between the two. Jensen: You know, David, one thing we didn’t touch upon at all is that the ancient Taoists were very suspect of words and language. They didn’t view language as a very high thing. Even though it was something they had to use, they felt it often got in the way. When I was a teenager building bridges in Minnesota, a steelworker came up to me and said, “Those who know don’t speak, and those who speak don’t know.” I thought, “That’s a very interesting comment,” but it took me twenty years to rediscover it in the Tao Te Ching. The I Ching has another very similar comment about words, “When there’s talk, there’s no sincerity, no accuracy. Revere words, and you soon wither impoverished away.” If you only rely on language, you can’t ever see the Tao. The ancient Taoists said “You may feel the process of enlightenment if you look at the Milky Way and feel that distant star the same way you feel your elbow, and vice versa.” That interconnection is the basis for Taoism. Hinton: This afternoon we were talking about how your dyslexia may have contributed to your distant, suspect relationship to language. It may have made you open to other ideas. Maybe as a dyslexic you were by nature enlightened? Jensen: Well, it made me a painter anyway. But the Chinese painting in Professor Poor’s class lead me to Chinese poetry, which I finally could read. That led me to philosophy. Now, you don’t understand how I can read so much. I read a lot. I read your books over and over again. But when I was in high school, and even in college, I hated reading. I hated language because they put a dunce cap on my head in first grade and put me in a corner. Maybe that was enlightenment? BILL JENSEN, born in Minneapolis, has lived and worked in New York City since the early 1970s and was one of the first artists to establish a studio in Williamsburg, Brooklyn. He came into prominence in the late 1970s and early 1980s during a movement that revived the predominance of painting. Intuitive and visceral, Jensen’s abstractions have long been admired for their unconventional compositions and profound sense of color. Jensen’s work is in the collections of the Metropolitan Museum of Art, New York; the Museum of Modern Art, New York; the Whitney Museum, New York; the Phillips Collection, Washington, DC; the Los Angeles County Museum of Art, California, and many others. DAVID HINTON’s many translations of classical Chinese poetry have earned wide acclaim for their ability to feel contemporary while also conveying the texture and density of the originals. He is also the first translator in more than a century to translate the five seminal masterworks of Chinese philosophy: I Ching, Tao Te Ching, Chuang Tzu, Analects, and Mencius. He has received fellowships from the Guggenheim Foundation, the National Endowment for the Arts, and the National Endowment for the Humanities and has won the Landon Translation Award, the PEN Translation Award, and most recently, the Thornton Wilder Award for lifetime achievement from the American Academy of Arts and Letters.